Here are some images that influenced me as a child or still inspire me today. 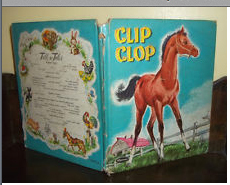 This is Clip Clop the horse who heard she was getting a pair of shoes and fantasized about wearing all the kinds of shoes she knew. Published in 1958 (slightly before my time), written by Nancy Hoag and illustrated by Florence Sarah Winship. This is the first book I remember looking at the pictures over and over again. I think it inspired my love of shoes. Unfortunately, I no longer have my original book but I was lucky enough to buy a copy online. 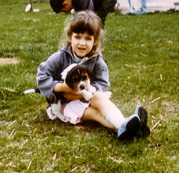 Me, in our backyard, playing with a puppy in my favorite blue shoes. This is another major influence to me as a child. Today I still marvel at the simplicity of the story, and the perfect marriage of words and images. It is my first introduction to the art of printing. I would stare at the images to guess how it was printed. It was the first book I noticed the use of 3-color printing, and how there are different values of the spot colors green and orange with the black. There are several 'Harry' books. My favorite is still Harry By the Sea. I remember reading these to my younger brother and sister, my nieces and nephews, and then later my own son. 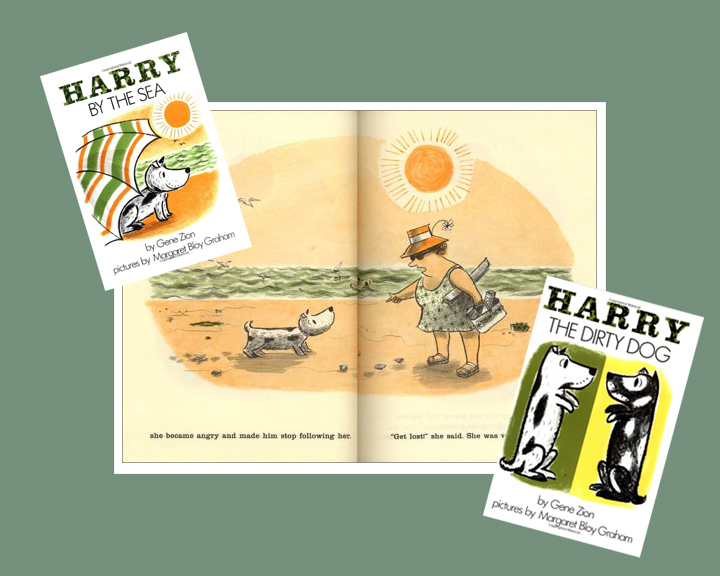 The 'Harry' books written are by Gene Zion, and illustrated by Margaret Bloy Graham. circa 1968. 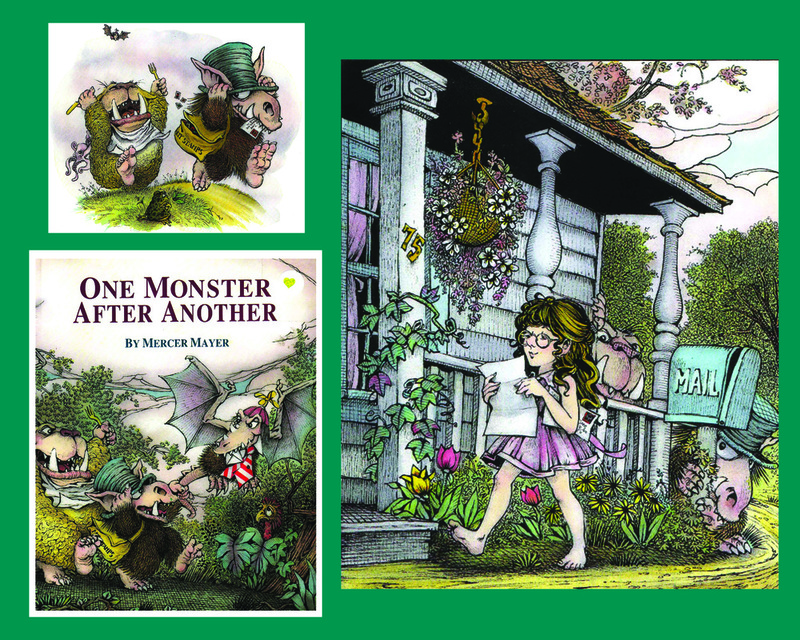 Another childhood favorite is by Mercer Mayer called One Monster After Another, 1974. I loved that book for its fantastical images and humorous story. Up until this book, most children's books I saw weren't far from reality. This one really plunged me into a fantasy world. I could be lost for hours imagining each scene. It was the first book that I noticed the author had a voice and had a sense of humor. Earlier books I read were just like a narration with illustrations. 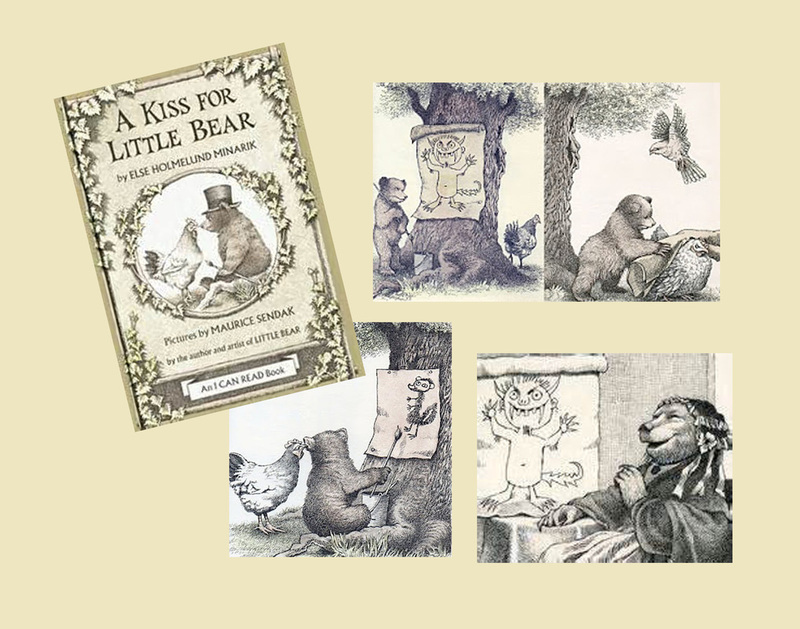 What can I say about the beauty and sweetness of Maurice Sendak's illustrations for A Kiss For Little Bear? The charming story is by Else Holmelund. The line drawings look like hand-colored etchings. Maurice Sendak is not only a Master of the Picture Book, he is great at adding and making allusions. Notice his monster he draws which looks like monsters from Where the Wild Things Are. And Grandmother Bear who sits and is dressed like Whistler's Mother. I just love the beauty of the illustrations and the expressions on the hen's face just cracks me up. So much expression on a chicken! I could go on and on about Maurice Sendak. He is one the greats! 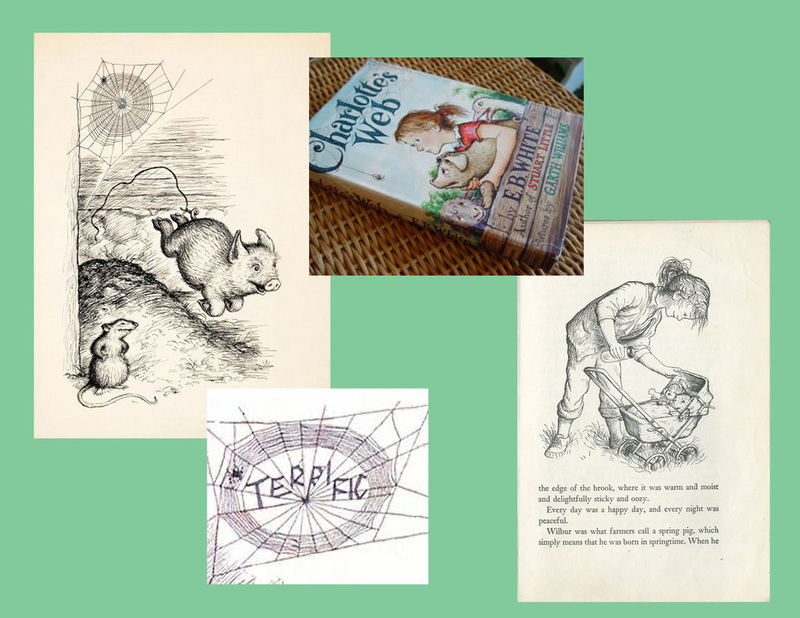 Charlotte's Web was given to me for my ninth birthday. The author is E. B. White, and illustrator is Garth Williams. It was my first Chapter Book I ever received and read cover to cover, many times. Mrs. Zuiderhoek read my book chapter by chapter to us at story time in Fourth Grade. I was mesmerized by the emotion and adventure. I really like the feeling I get from the illustrations. I think the farm life was interesting to me, because I had met a new life-time friend, Diane Hogan, who lived on a farm and I could imagine the adventures of the book and equate them to her stories.